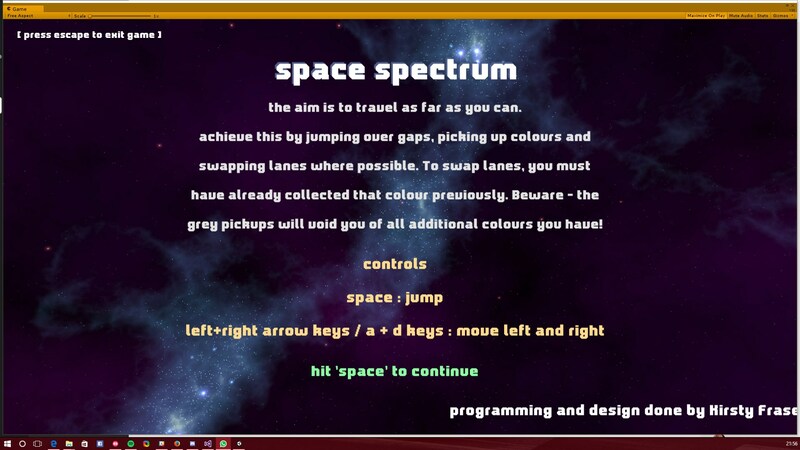 I interpreted the theme for the spectrum with the use of colour and would create an endless runner that had different coloured lanes. The player would have to be the correct colour for the lane they were in and could only swap lanes at sections that offered the colour that you wanted to move to. The first two days would be spent trying to get the basic prototype done which would allow me to work on improving it for the next two weeks of the game jam. Progress on the first day went well - managed to get the basic lanes and player movement set up. Once this was in place, I wanted to focus on getting the areas where the player would pass through to get to the other colours. I managed to get halfway through this before having to call it a night. Bit of a slower day for progress. A few design and technical walls had been hit but finally got a basic prototype of the game done. Finished up with getting some more art and polish into the game. This was the first time that I had used magic voxel for art. I'll probably keep with it throughout the forthcoming weeks to improve the art and keep iterating. Besides this, some changes were made to the code as to how the checkpoints and lanes we're being generated which took majority of the day to get back to the state I was in last week. Thankfully I've been graced with a three day weekend and not a great deal to do in it so I'm hoping with some testing, feedback and iteration, I can start to polish this game up ahead of submission next weekend. player feedback. This includes a particle effect when landing after a jump(still buggy) and the player having a bit more motion while running. Animation may be being added later depending on time. Balancing. Player will begin in middle lane and the spawning of checkpoints has been altered so no matching lane colours and pick ups appear. I.e. yellow pickups in the yellow lane. further improvements have been done to the player jump to make it more believable. Ability to use A/D keys for moving left and right. New build should be live tomorrow once more issues have been resolved. 2. added in background music (thank you freesound.org) and SFX for the players death, jumping and colour pickups. I use five different sounds for jump and death, choosing one at random to give the game a bit more variety. 3. Still playing around with the balance of the game slighty - feedback pending. I'm realising now I'm going to have to have a cut off point where I'll be happy to submit the game and work on expanding it after the jam has finished. 1. Getting all bugs related to gameplay squashed. 2. Upgrading the UI elements to move away from Unity's default ones. We shall see tomorrow if we can get it done in time for submitting tomorrow night (esk!) Wish me luck!